In 2011, I got to teach a feisty group of kids a dance routine for the Annual Day Program at the school I used to study at. They were a motley crowd of boisterous and enthusiastic kids. Somewhere behind them all, was a slip of a girl. She was silent. Thick glasses framed her tiny face; she had a head full of oily hair that clung to her scalp. She smiled broadly all the time, her little teeth like okra seeds. I didn’t hear her voice, even if I strained myself. I noticed that the other kids didn’t talk much to her – she tried to talk to them sometimes, but they’d mostly ignore her. But she gave me her best, learning all her dance steps and performing them with gusto. She never drew attention to herself – being a wallflower of sorts. I must confess I was arrogant too. Some days I didn’t even look at her, focusing instead on the ones I thought had potential, the ones that drew attention to themselves and had the most buoyant energy. I placed her in the last row. I didn’t pay attention when she missed a step, instead busied myself with convincing a more boisterous child to tone it down. She still danced, unnoticed by me. Until one day, when a boy decided to push her for his amusement. In seconds, her eyes brimmed with tears. I helped her up, and took her aside to the stairs. The little girl didn’t say much, she just nodded or smiled when I asked her if she was alright. She smiled at me, beatifically, nodding to tell me she didn’t need anything and that she was okay. As her tears dried up, in a soft, squeaky voice, she said ‘thank you’. I asked her if she could tell me if the kids often did that to her. She looked at me, her eyes widened. She was hesitant. I held my gaze, as though to tell her I wouldn’t let her down. She looked down, sadly, and nodded. I didn’t know what to say. And even if I did, I didn’t have a means of ensuring that she’d be taken care of – I had only a month with the kids at school. She went back to class, and I had a lump in my throat. That was when it hit me hard: bullying scars you. Here she was, this little girl with a soft temperament, thick glasses and oily hair. Here she was, this little girl who simply wasn’t accepted or given the friendship she had every right to have. At that point, I realized that whether you are 9, 19, or 29, you’re always expected to be a certain kind to “fit in”. It is always their idea of what you should be that you should be – and if you aren’t, well, you’re out. After the day’s practice wound up, I went back to the classroom to say ‘bye’ to the little girl. She came running up to me and pressed a little model of the Taj Mahal in my hand. The lump in my throat grew bigger, and tears threatened to flood my eyes. I croaked my thanks, and hugged her. I told her I wanted her to keep it – it was hers. She softly said that she wanted me to have it. Later, I noticed that one of the minarets in the model was broken. But it sent me a strong message. To Shah Jahan, the man who had the Taj Mahal built, it was an edifice in recognition of the love he had for his beautiful wife, Mumtaz. In the entire span of time that it has remained, the monument has come to symbolize impeccable beauty. To me, the broken model of the edifice represented the celebration of true beauty, of the beauty that is inherent in imperfection, of the beauty that lives in one’s soul. 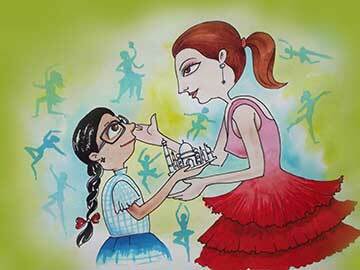 To me, the broken Taj Mahal will always edify the little girl’s spirit, and a reminder of how much work we have left to deal with bullying. The author runs The Red Elephant Foundation. She is a lawyer and writer by profession. She can be reached at kirthi.jayakumar15@gmail.com.